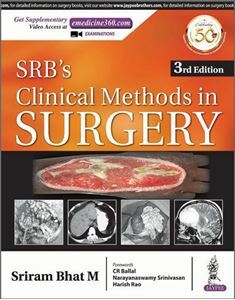 SRB’s Clinical Methods in Surgery, third edition is the updated part of second edition with lots of additions and corrections. It covers in detail clinical examination in various surgical areas and conditions with reasons and analysis. Basic general examinations are discussed properly with illustrations as often students find it difficult to understand. Enough photographs and illustrations are added. All chapters are thoroughly edited and proper photographs and diagrams are added. Each chapter contains clinical examination methods, investigations, brief outline about all the conditions, which are relevant surgically. In selected chapters, where students are given cases during examinations, such topics are discussed in the form of case discussion so that students can have idea how exactly examination questions are asked in clinical side. In a few chapters, clinical pearls are added as a surgical wisdom which is important while treating the surgical patient. New chapters on Instruments, X-rays and Specimens added at the end for quick look to all students especially during surgery practical examination. This book is made to concentrate in detail on clinical examination methods of every surgical area with adequate clinical photographs with analysis and reasoning so that students can be very well versed in clinical methods and final diagnosis. All surgical topics are precisely highlighted at the end of each chapter for review whenever needed. Added to these videos showing how to examine a particular patient (common surgical cases) clinically is shown with a voice background which will be very useful to students while examining the particular patient. This clinical book will be useful to undergraduates, postgraduates of MBBS and MS as well as useful to Ayurveda and allied medical fields; it is also useful for practicing clinicians to have a quick review.